"Play is more than just wasting time; it's learning. Developmentally Appropriate Play: Guiding Young Children to a Higher Level is a guide for encouraging smart play in one's children and encouraging them to have more fulfilling experiences through their play. 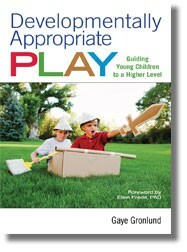 From weaving in education, interactions, and more, Gaye Gronlund offers much perspective on the power of play, and makes for quite the enlightening read for parents and early education teachers.